on the dish and strain the gravy on them half an Anchovy chopp'd small and put into the Jar with the Pidgeons water a rich gravy - you may lay Mushrooms on force meat Balls, or hard Eggs in the dish - the Pidgeons shou'd have a small piece of Butter put into each and be sew'd close. 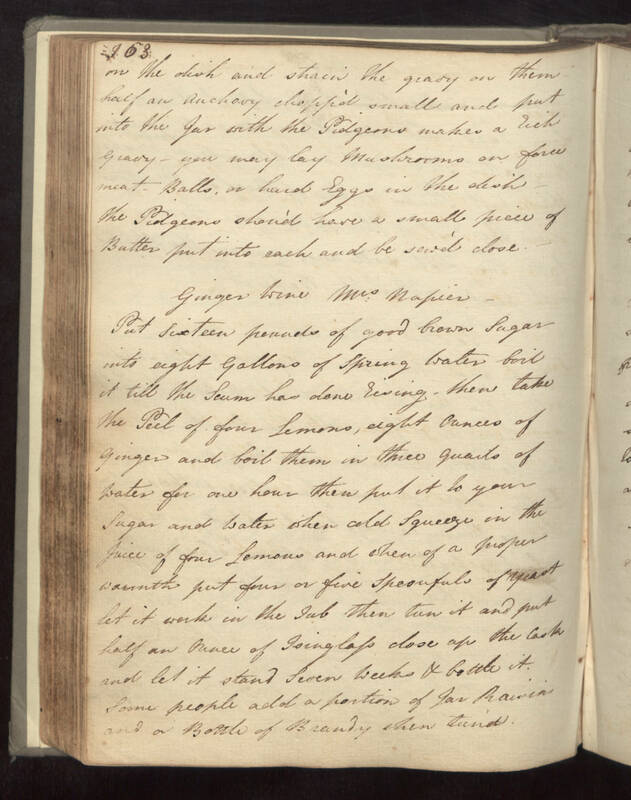 - Ginger Wine Mrs Napier - Put Sixteen pounds of good brown Sugar into eight gallons of Spring water boil it till the Scum has done rising - then take the Peel of four Lemons, eight ounces of ginger and boil them in three quarts of water for one hour then put it to you Sugar and water when cold Squeeze in the Juice of four Lemons and stew of a proper warmth put four or five spoonfuls of yeast let it work in the Tub then turn it and put half an ounce of Isinglass close up the Cask and let it stand Seven Weeks & bottle it. Some people add a portion of Jar Raisins and a Bottle of Brandy when turn'd.